Wed, October 22, 2014: After the storm of last night. Mon, September 1, 2014: 5m 2v icosa geodesic dome pitched incl. PE rain cover. Fri, August 15, 2014: First step of 2v icosa PVC dome, with simple stress test. 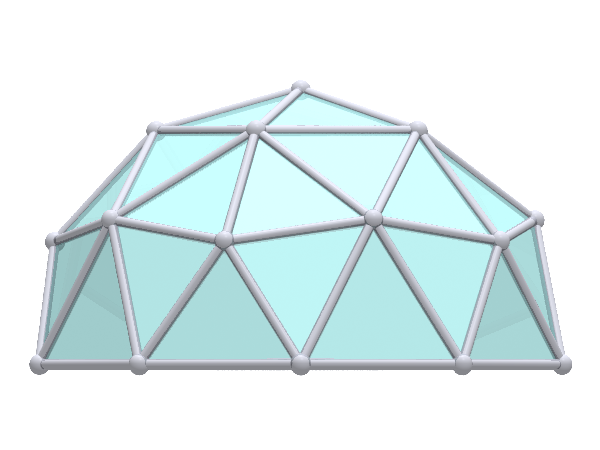 Thu, August 7, 2014: Exploring 2v icosa PVC pipe based dome. Sat, April 28, 2007: Moved the dome on the existing floor and interior (where I had the yurt), preliminary setup with interior cotton and PE as rain cover (from the yurt-setup). Fri, March 16, 2007: Pitching the 6.33m 4V geodesic bamboo dome finally. Mon, March 12, 2007: Possible variant to 4V: L2 which is a geodesized L1 or 2V variant, less strut length variance - this discovery comes from working on Geodesic Polyhedra. 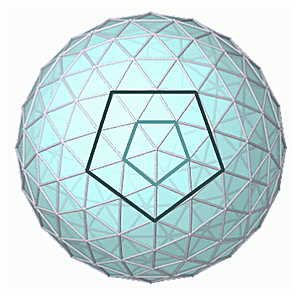 Wed, January 24, 2007: Including also activities from 2005 when I built 2V, 3V and 4V model, for sake of completeness - as information is already available in the Geodesic Dome Notes. Thu, January 18, 2007: Starting the diary with planning. 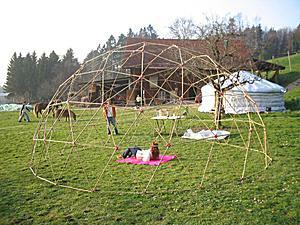 In winter 2006/2007 I was thinking of reusing the left-over of bamboo sticks I had: 130 x 185cm 15-18mm diameter bamboo. 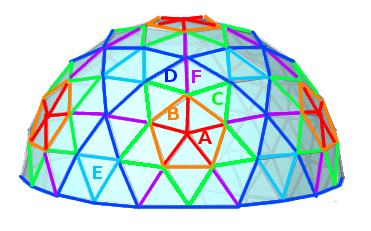 After checking the geodesic dome notes I decided to give it a try with 4V 4/8 icosahedron dome. 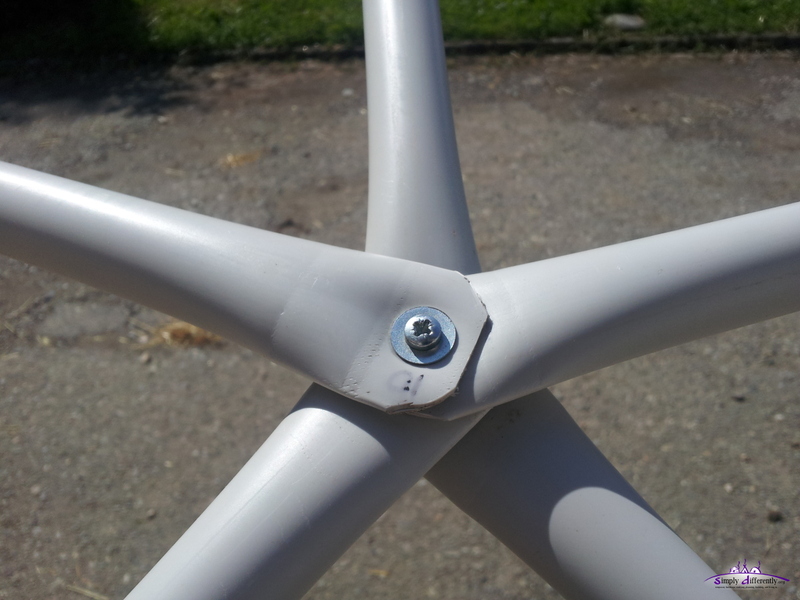 As I did already a 4V 4/8 Icosahedron as model, I know exact working and the connectors are important. After an email exchange with a reader of my site, who gave me a hint to use soft pipe as connector, I thought to go ahead. 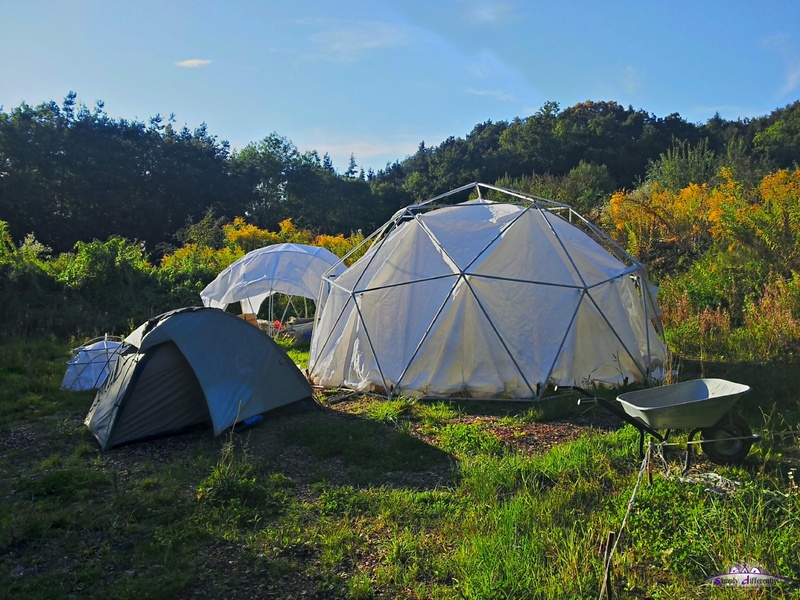 For fall 2014 I constructed a 2V 4/8 Icosahedron dome with PVC conduits as rain shelter mainly. I went for the hubless approach where the ends of the pipes are flattened and used to connect each other. Idea is to have a very lightweight, simple and cost-effective 5m 2v icosahedron dome, using one piece 8m x 8m PE rain cover. 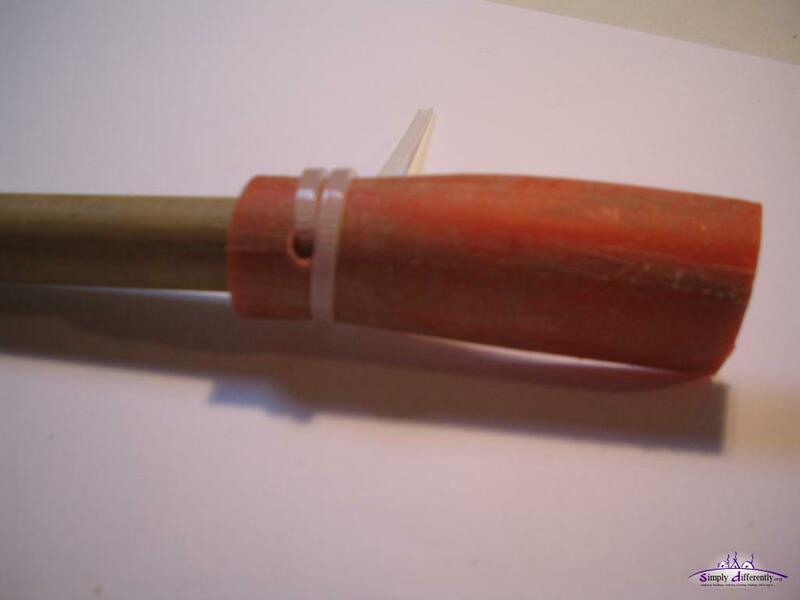 Since I go "hubless" there are no connectors, but the PVC pipes are squeezed at the end and their edges cut to form a "duck beak". I use the setup which I developed for the LC Dome: wire hooks and bottle caps as "captures" to attach the rain cover, and hang the PE rain cover inside of the dome skeleton. Read the next pages (scroll down) about individual steps taken. 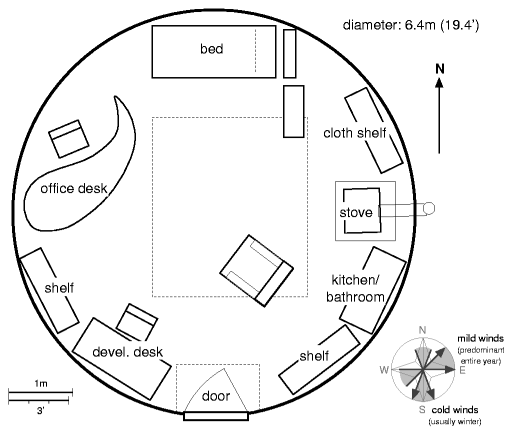 The idea was to build a ~6.4m (19.4') hemisphere or dome, which I can put on the floor of my existing 6.4m yurt I built (2005), and also then try a star dome as well on the same floor and interior. See also my star dome diary as comparison. 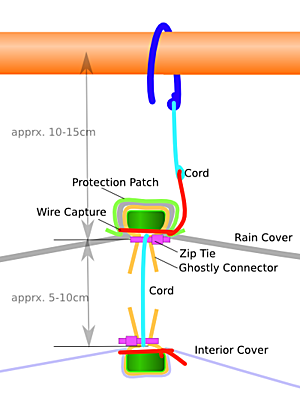 As in case of the geodesic dome, the connector requires primary to provide pull and push stability, and so the squeezed part becomes the common connector with a screw, and 2nd hole keeps the pipe and the bamboo (with variable thickness of 10 - 18mm) and a pin, bent nail or a cable binder keeps them together. 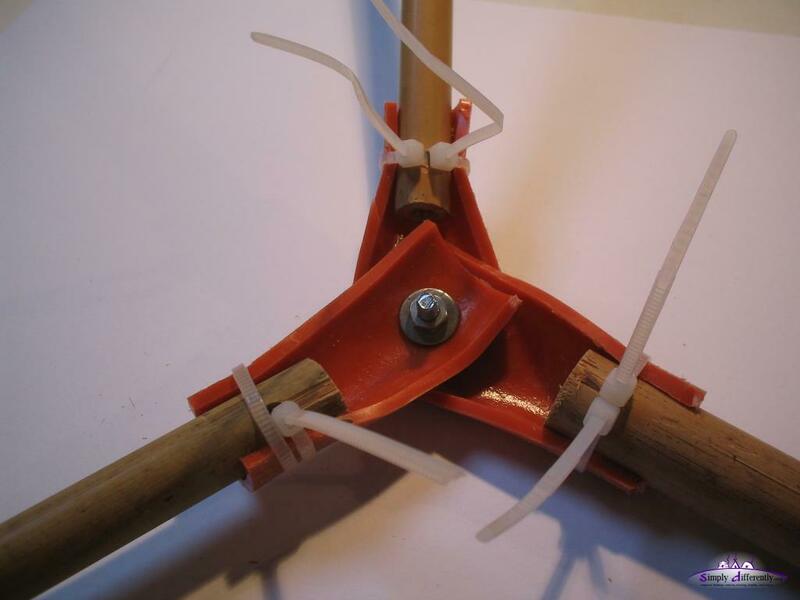 It might be important to have a round profiled pin to avoid the bamboo splitting when pushed or pulled - or otherwise strengthen so the bamboo doesn't split, e.g. tapeing the end. 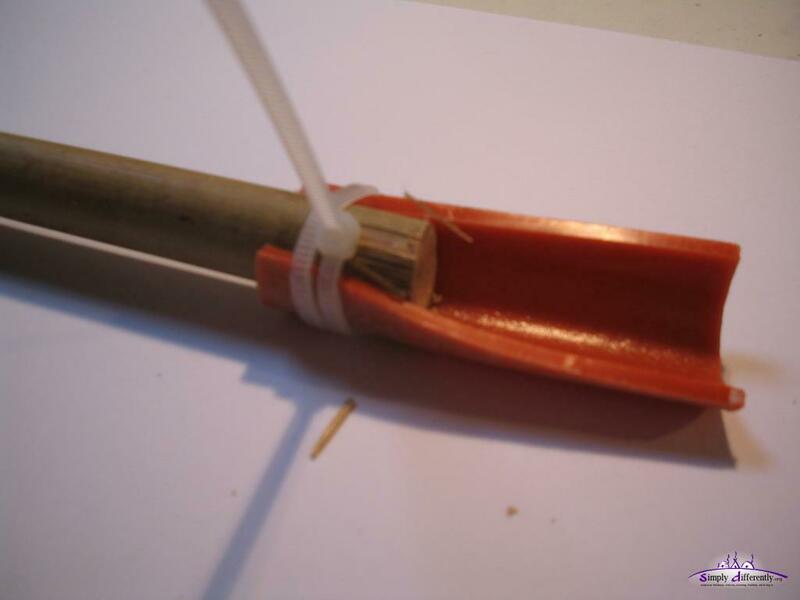 Another approach with a half-pipe, less stable but saving material, and suitable when struts diameter varies (as in my case of using bamboo): a longer cable binder 3mm wide and wind around 1 1/2 times, and use a M4 screw to connect the endings. As a result of the tests I gonna use 4mm wide cable binder instead just 3mm, this means I drill with 4mm the two holes per connector. In order to guess the pull or push force on a junction, let's calculate 150kg for the entire roof. The maximum weight appears on the bottom. There are 20 connectors 1st line above the ground, where 2 struts push (or pull), so 150kg / 40 = 3.5kg per strut - whether those two cable binders can hold that, let's test it. I likely go for the smaller one. The door provides some challenge, I tend to make a triangular door, fitting one of the triangles of the 4V, and remove 1-2 struts. The green and pink only suitable for >7m large diameter domes. The yellow seems most suitable for me at 6.3m diameter, I can use an existing door I made already 1m wide and 1.7m hight for a 8.4m yurt (1.70m wall height). I will sew a cover which fits also the star dome I have been planning, so I can exchange the entire setup. Essentially leaf-like approach as described there. So I "loose" apprx. 76cm diameter if I keep shelfs on all sides, so I likely put the shelfs on one side, and lower stuff on the other, let's see. 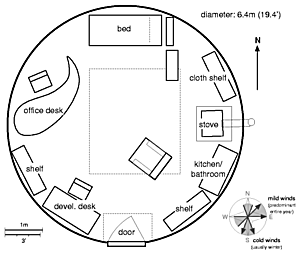 It's obvious a spherical space cannot hold rectangular or cubic furniture that well, in particular high furniture. With a high ceiling and making a 2nd floor for beds is an interesting option, in particular in the winter-time when the heat from the stove rises. "1/4 moon": 2 pieces and 5 columns, best light distribution from the skylight. "eclipse": 1 or 4 pieces, 4+ columns, the light from the skylight reaches both levels, the 2nd floor and also the base. Once I'm further with the development, beyond just planning, some of the notes move into the Geodesic Dome Notes. Continue to read my diary on the next page(s).